This article was written for Cesar's Way magazine in 2011 but never published. We no longer recommend dog parks due to the increasing number of dog attacks in these places but if you are determined to go anyway, this article can still help you making it a better experience. Dog parks are fun for dogs and people. You can bring your dog to these fenced areas to play off-leash fetch games, play with other dogs or whatever else you and your furry companion might enjoy doing. Dog parks are a great way to add some variety to your dog's routine and reward it with playtime for good behavior. But it is important to remember, that dog parks are a reward. Do you remember Cesar's fulfillment formula? Exercise should be structured and involve following you (the owner/pack leader) in some way; think walking, biking, rollerblading, hiking, etc. Running around in a backyard or dog park is not achieving the goal of providing a structured exercise, it's just fun. Discipline is not punishment but setting rules, boundaries and limitations for your dog. Dogs like rules. They appreciate knowing what is expected of them and are very happy to do it for you. You just have to explain to them to—i.e. not jump up on you whenever they feel like it—in a way they can understand. Affection is a wonderful reward for a dog; they love it. Whenever your dogs gets affection (i.e. petting, food, games, etc. ), it tells them that you want them to do more of what they just did (half a second ago, not a minute ago). So remember to not pet them or pick them up when they bark at another dog. Ask them to be calm and relaxed first and then shower them with love; remember, "You get what you pet." Going to the dog park is definitely in the affection category and should be a reward, not a way to avoid proper, structured exercise. Take your dog on a long walk before you go to the dog park or rollerblade or bike with it, so when it gets to the park it is in the right state of mind. Most of us have seen how one single, misbehaved, or hyper-active, or simply dominant dog can change the entire atmosphere of a dog park in an instant. Whoever brought that dog in usually earns nasty looks from the other dog owners, but more importantly it turns what should be a fun time for people and their dogs into a stressful situation for everyone. So let's review a couple of simple tips on how every dog owner can do their part to ensure that dog parks are fun for everyone and remain safe for all people and dogs. A key ingredient for a great dog park experience is the state of mind your dog is in before it even gets near a dog park. Take your dog on a nice, long walk or exercise riding your bike, rollerblading, using a treadmill or whatever your routine might be. Get your furry friend tired before you reward it with free playtime. Just like with any door, you should be walking through the gates of the dog park in front of your dog and it should be behind you. Ideally, have your doggy sit outside the gate (on leash of course) and wait for you to ask it to enter while you walk in first and then call it in. Have your dog sit down again and wait while you remove the leash and only then release it to begin play time. In the animal world body position matters and if your dog gets to just run in first, hite thinks, it owns the place and will behave accordingly. However, if you walk in first, your dog understands that this is your park and you are setting the rules in this place as well. It will result in a better behaved doggy and better dog park experience. If there are two gates to pass through—there usually are—make sure you pass through each of them first, not just the first one. This might not be that easy to accomplish the first time you try, especially when there are many excited dogs inside the park curiously checking out the newcomer. Don't be discouraged if it takes a while at first to enter the park in an orderly fashion; just be patient. Wait for your dog to calm down before you move on. It's good practice to make your dog wait like that going in to or out from any area, room or door no matter where you are. You can practice this pretty much anywhere and it really makes a big difference. Keep an eye on your dog at all times. You are still responsible for what your dog does, even if you are in an off-leash dog park. Check if it is behaving properly and step in if it isn't. If your dog is showing dominant behaviors (i.e. tail above medium, head over another dog, mounting, and so on) step in and communicate your disagreement with the behavior to your dog—within half a second of the behavior, otherwise your dog won't understand what it did wrong. The other dog owners will be grateful to see you keeping an eye on your dog. This of course also goes the other way. If you see another dog misbehaving and an owner not doing anything about it, don't judge. They might not know that their dog is doing something that can lead to trouble. Strike up a friendly conversation and offer some tips to keep everyone safe. Most dog owners are friendly if you are worried for the safety of your dog—just be nice about it. Dog parks are a great environment to watch your dog being a dog among his own species. It is educational and fun to watch them play. So leave the cell phone in the pocket, chat with some fellow dog owners and always keep an eye on buster. Most dog parks have water fountains of some kind. Make sure your dog gets enough water while you are there. If it runs around, it needs to drink regularly. If you are unsure about the water supply situation, make sure to have enough water in the car so you can get it if necessary. Of course you shouldn't leave your dog unsupervised to do so. If you're by yourself you might have to take your buddy with you to make that trip. It is also a good idea to invest in a foldable water bowl you can stuff in a pants pocket and carry with you. Even if there is a water fountain, it could be out of commission. And of course adhere to all dog park rules. They are posted outside the park and are designed to keep everyone save; more on that below. Leaving the dog park should take place in the same orderly fashion you entered. 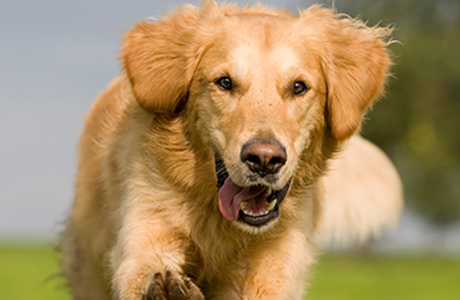 Call your dog to you instead of running after it. If your dog doesn't come when called, it might be good to train it to do so—it makes things a lot easier and also puts you in a leadership position. Have your dog sit, put the leash on and walk out ahead, the same way you entered. Again, take your time. It is more important for your dog to learn to do it the right way than to do it fast. If there are two gates to pass through make sure you pass through each of them first. The dog park 'rules of conduct' are usually posted outside the park and it's a good idea to read them the first time you go there—not following them can lead to being asked to leave. These rules are designed to keep everyone save and ensure the dog park remains a peaceful, fun place for all. There are many incidences of dog fights in dog parks each year and all of them are usually a result of either not following the posted rules or not keeping and eye on and correcting your dog's behavior when necessary. Many of these rules circle around dog registration, dog tags, spaying and neutering, vaccinations, flea and tick prevention and age restrictions; all reasonable things that make a lot of sense when dogs get together. Let's first look at some important rules you encounter and then at some more questionable ones—you will still need to follow those as well if you choose a park that has them posted but it is always good to know what is important and what not so much. If you have a perfectly behaved, well-balanced dog with no issues many of these rules can seem over-protective, but keep in mind most dogs are not perfectly behaved and these rules are designed for the average visitor. Most dog parks have separate areas for smaller and larger dogs. Make sure you go to the right area. If you have a puppy, the small dog park might be more appropriate to get started when the puppy is still little—even if you have a large breed dog that eventually should go to the large dog area. Keeping large and small dogs separate is important for several reasons. Larger dogs, especially working, herding and hunting breeds tend to have stronger prey drive and might look at smaller animals as prey. If your dog takes an interest in chasing cats, squirrels or rabbits and you haven't been able yet to explain to it that such behavior is not desired, it will probably not care much for small dogs either, especially if they behave in a dominating or challenging manner. Also, keep in mind that fights do happen at any dog park and as long the dogs involved are of comparable size, any damage will probably be less severe than if that were to happen between larger and smaller dogs. Especially owners of larger dogs will often get blamed by the owners of smaller dogs in such cases, even if the smaller dog started the fight. That it has little chance of winning a confrontation against a ten times larger dog doesn't stop it. To dogs size doesn't matter as much as each other's energy. And while dogs can distinguish size differences in front of them, they don't have any awareness of their own—smaller—size as it relates to another dogs. Most dog parks limit the number of dogs anyone can bring into a dog park at the same time to two or three. That is a good rule as it is pretty hard to keep an eye on two dogs yourself already. What would you do, should both of your dogs get into trouble at the same time at different ends of the park? I personally recommend only bringing one dog per person at the time, no matter how well they are behaved—there are always other dogs to consider. If you have more than one dog, consider bringing some friends—one to watch each dog. As good as it is to being able to keep an eye on all dogs you bring, this is usually not the reason dog parks have this rule. The reason this rule was established was to prevent dog walkers from just taking all the dogs they pick up to some dog park, instead of actually walking them. It is a valid point as it directly links back to the above. This is actually a rule at some dog parks and the reasoning for it is usually that dogs being on leash—when surrounded by other dogs—supposedly become more aggressive. This claim is really not supported by any facts. It is most likely based on some people's incorrect interpretations of why dogs are pulling on leashes when on the walk or meeting other dogs. The leash pulling has more to do a lack of leadership on part of a dog owner than anything else and establishing this as a dog park rule seems ill-informed at best. Dogs are usually leash-reactive out of anxiety and it would be better to resolve such anxiety before taking that dog to a dog park in the first place. However, this rule does not exist at that many dog parks and walking a dog around on leash in a dog park, where other dogs approach, can be a highly effective way of training a dog to tolerate other dogs and helping a dog owner becoming/remaining a leader to their dog in light of distractions and temptations. Also, when you take your dog to the dog park for the first time, a leash allows you to safely introduce it to other dogs while maintaining full control. For this reason this rule seems counterproductive for a dog park. So look for dog parks that don't require this if you want to leash your dog in the park for whatever reason—there are plenty dog parks where you can. Something equally strange (but also somewhat rare) are restrictions on bringing any food into a dog park. I heard this being reasoned as "dogs will follow you around and not play with other dogs." This however is hardly supported by what dogs do in a dog park when treats are present. They might sniff the treats out and try to get one, but if they don't succeed they just move on and do something else—remember, dogs can only focus on one thing at the time and are easily distractible. So there is really no reason for such a restriction but it does exist here and there. It also hinders performing any kind of treat-based training activities, like teaching your dog to come when called inside a dog park, which is really a nice place to train with distractions. So that's it. These are the basic rules for mastering the dog park and making the experience a positive one for all participants. Following these guidelines will help you maintain the respect of your dog in a dog park and getting better behavior in return while you are there. It's all about providing positive leadership to our fury companions. Stay calm and assertive and remember to always pick up after your pooch.